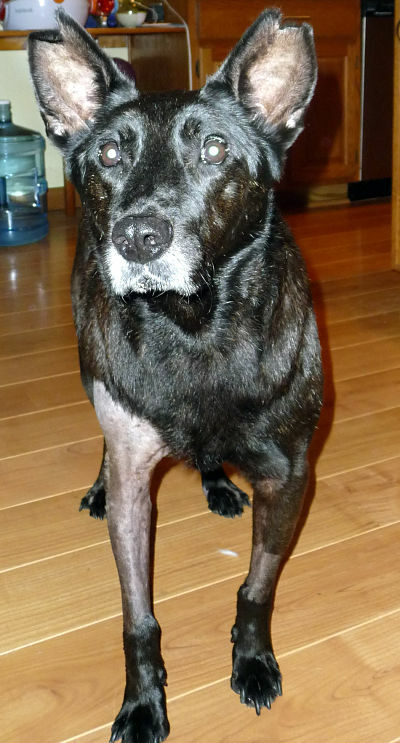 After Petey’s diagnosis of Immune Mediated Hemolytic Anemia (IMHA), we began our journey into treatment. He had been in the hospital for several days and was released on August 17th, 2009. He was prescribed: 50mg of Azathioprine daily, 1 ½ 20 mg tablets of Prednisolone, twice daily, ¼ 80 mg baby aspirin daily, and 100 mg of cyclosporine, every eight hours. A follow-up was scheduled for August 19th. On the 19th, we continued all medications as previously directed and a recheck was scheduled for August 26th. In the days in between appointments, Petey’s abdomen started to show signs of what appeared to be bloating. I called our vet and found that it was most likely Ascites, an accumulation of fluids in the peritoneal cavity. Unless it gets considerably worse, we were given the ok to wait until our next appointment. At the appointment, he was prescribed 50mg of Lasix for the swelling. His CBC showed slight improvement. A few days later his abdomen was the same and now one hind leg and front leg was very swollen. On the 28th, we were back in ER. It was determined that the swelling was part of the ascites. By the 30th, we were in ER yet again. The swelling was so severe in his front leg that we didn’t feel we could safely wait until the next day (Monday). This time, a Penrose drain was recommended to drain what had become an abscess in his front leg. We were sent home with the dreaded e-collar, 375mg of Clavamox and 50mg of Tramadol for pain and we were to see Dr. Slusser as soon as possible. We were able to get an appointment on August 31st and Petey was given an ultrasound to check his heart – to rule out any other causes for the swelling. Cardiac problems were ruled out and a recheck and drain removal was scheduled for September 4th. To be continued….